When I handed in my resignation letter back in 2012, I was sure that that season of my life was over and I was closing the chapter to almost 9 years of my life spent with Coro Cantabile. Years of rehearsing, singing, ministering and touring with them has come to an end. I was saying goodbye to people who had become part of my life not only as ministry partners but friends — family even. There was a finality that was sad but somehow I felt was appropriate. So when I got the news that they would be coming to the UAE as part of the Hatid Giliw 2015 tour, I was beyond excited. They would be hosted in Dubai and I was in Abu Dhabi. I did not know the church nor anybody from the church who would be hosting them. They had one concert and my plan was to watch the concert, fellowship with them — catch up for a few hours and then head back home that same night. But God in his infinite wisdom and kindness gave me so much more. I got to experience probably one of the highlights of my life here in the Middle East. The Guillen family who were hosting the Coro boys immediately and unquestioningly opened their home to me and God’s Way Fellowship lead by Pastor Evan Tagaña, the church hosting the group, welcomed me as one of them. For five short but awesomely wonderful days I got to experience being part of a touring group again although this time experiencing it in a different way — having the vantage of someone from the outside looking in. It brought back so much memories of tours of the past, experiences, and stories. 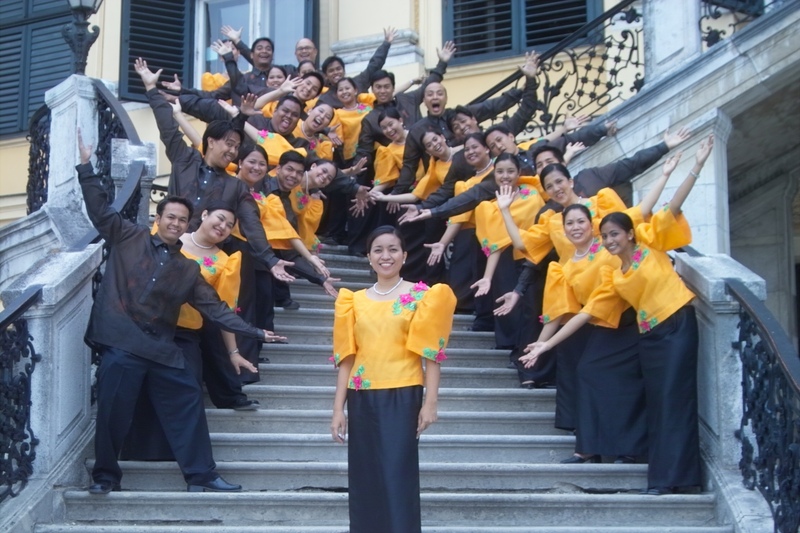 I was part of the Hatid Giliw 2005 group, Coro Cantabile’s maiden concert tour outside the Philippines. It was also my first time going abroad, so that was pretty special. 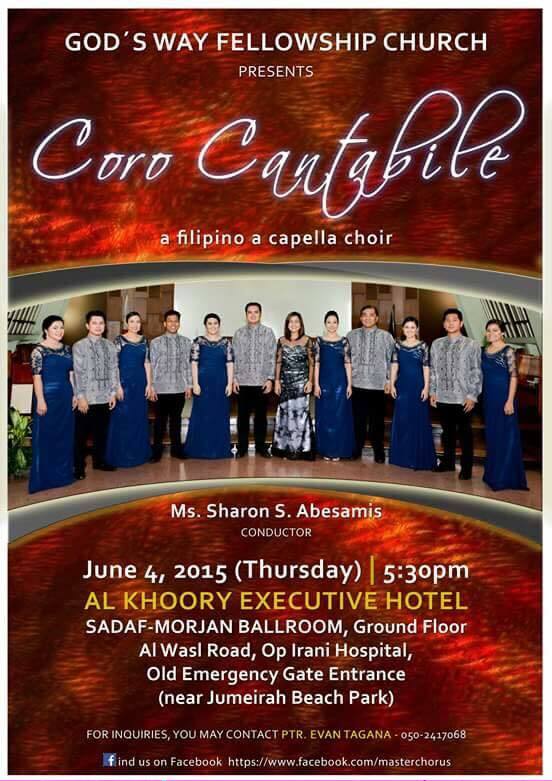 What made this time also special was that it was Coro’s maiden concert tour in the Middle East. 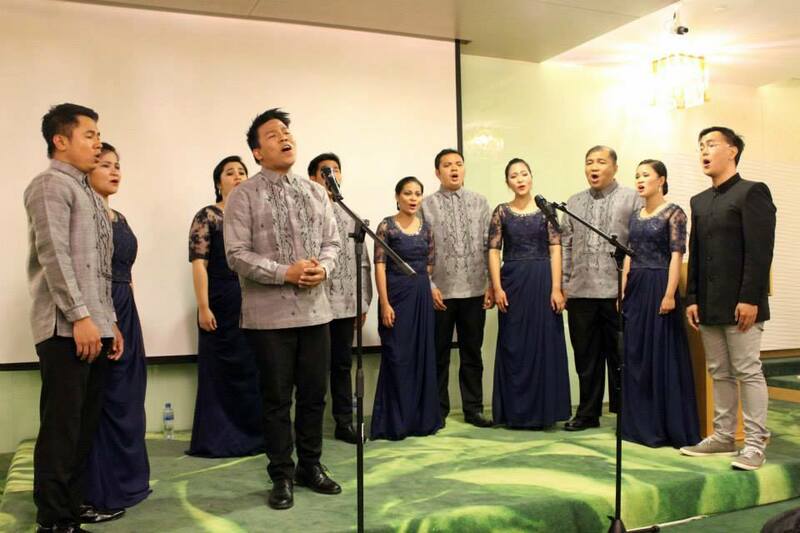 Flashback to when we were just dreaming and wishing that someday Coro would be able to go to countries that choirs from the Philippines would not normally go to — the Middle East, Africa, even Israel. Seeing this vision come to fruition and to actually be part of the team experiencing it was priceless. With the short time I had with Coro in Dubai, I have come to learn and realize some things. First is that music in itself is a powerful tool. It has the power to move people, to evoke emotions of happiness, longing, joy and sadness. It can even push, encourage and uplift. But it becomes even more powerful when it is used for its purpose. It has been said that the chief end of Man is to glorify God. I believe that God, being the Great Creator, created music not only for our pleasure but His as well. So much so that even songs about romantic love, about patriotism, even fun and silly songs He can use to pave a way for us to worship Him. It has always been Coro Cantabile’s desire to not only bring happiness to people watching the concert but to bring the people to the source of true happiness. Second, like what the family of Christ should be, music is inclusive in a way that it joins people regardless of race, age, gender and background and holds them together. Being with brothers and sisters from God’s Way Fellowship, listening to their testimonies and hearing about how God has been moving in their lives and in their church as they answer God’s call for them to be a church that is always open, welcoming missionaries, welcoming God’s servants, welcoming people seeking God, or even people just needing a place to stay — being a house of refuge, made me realize that sometimes we as a church have the tendency to focus on the wrong things and miss out on the opportunities that God is prodding us to do. We unknowingly project an air of exclusivity and sometimes alienate not only people who are seeking God but even our own brethren. We must remember that as children of God we are part of a bigger family, one that transcends affiliations, denominations or culture. 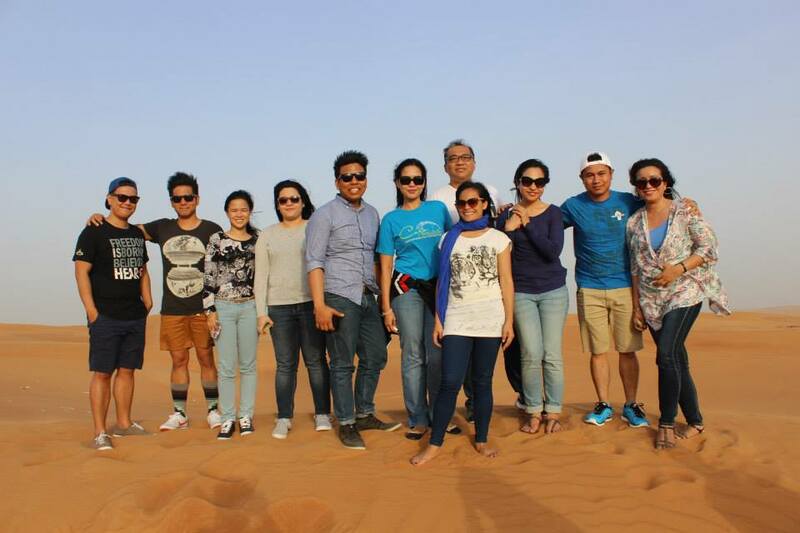 Third, the whole experience affirmed that God bringing me to the UAE was not an accident. He has a purpose and has put me in a unique opportunity to serve Him in this country. God knew I needed that affirmation at that time and He so graciously did. I will never stop to be in awe of how personal a God He is. 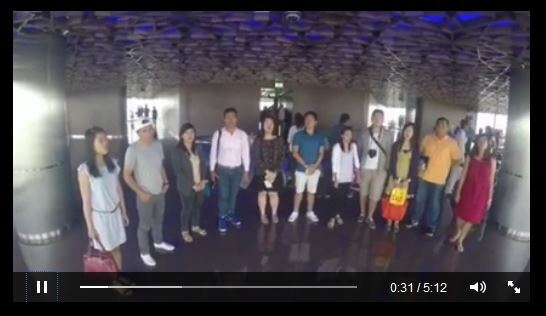 As I watched the 2015 Coro Cantabile Hatid Giliw team, I could not help but feel nostalgic. I realized how much I missed singing. I missed the people whom I sang and ministered with for years. But I also felt pride. 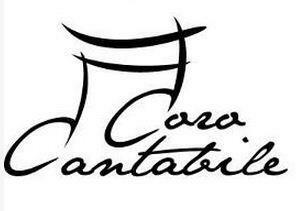 I am proud of Coro Cantabile, I am proud of having been part of this group. I am proud of seeing the next generation rising up to the challenge of bringing Christ to the world through music. 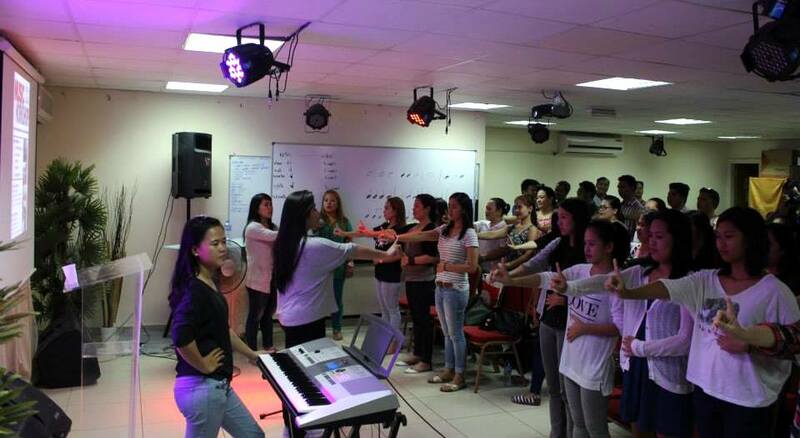 I am proud of how Coro Cantabile, as a ministry is adapting, moving and responding to the need — to the call God made. To know more about Coro Cantabile click here and here. I will always treasure the memories I made, the people I have met and the family that I have in Coro Cantabile. My heart is full of joy knowing that no matter where I am in the world, I will always be part of this circle, ever expanding, ever welcoming, ushering people to the Master Musician in worship — a glorious foretaste of the future we have in Christ. Sige na nga, even if I rarely check FB. Ang galing. Wish I could’ve heard you guys. Hi ate, they do have performances back there. Most of them free admission. You can check out their facebook page for information on upcoming concerts.